My kids are so excited about Halloween. This is the first year that they have been old enough to understand what it is all about and they can hardly wait. I don't know what got them so excited about it but for the last month Asher has been asking me (at least 4 or 5 times a day) if it is Halloween yet. I finally had to make him a paper chain counting down the days so that he could see we still have quite awhile. He also really wants me to finish his Halloween costume (he wants to be a pirate and Rose wants to be a bat) and several days ago informed me, "Mom, I'll watch Rosie and we will be really good and you sew my pirate hat right now." I wish the being really good part would happen so that I could get them done. But maybe I shouldn't get them done too soon or they will be worn to pieces before Halloween even gets here! This week I had someone contact me about Christmas programs. She was wondering if I had written or knew of any programs featuring women from the scriptures that might be appropriate for their Christmas party. The only program I am familiar with is "The Women Who Knew Jesus" script. I've seen it performed before and it is beautiful. 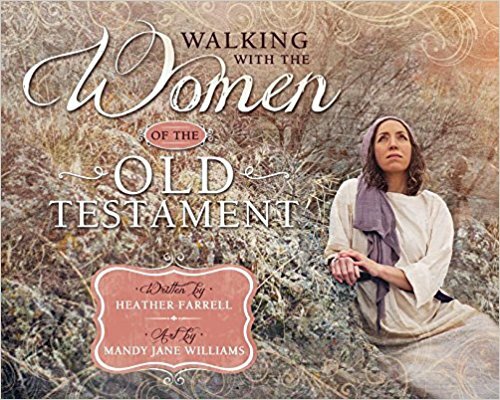 It highlights six women from the scriptures, several of whom we don't know anything about at all like Mary's Mother and the Inn Keeper's Wife, and it is powerful... not to mention easy to perform. I thought I'd pass the link along in case there are other of you who are looking for programs for Christmas parties. 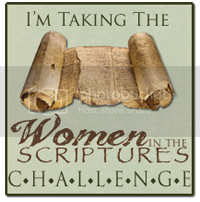 If you happen to know of any other scripts featuring women from the scriptures PLEASE let me know. There is a shortage of them, which I guess means that someday I will have to write one! About a year ago I wrote a guest post for our Gift of Giving Life blog about how midwifery used to be a calling in the LDS church and how women used to be called by General Authorities to be midwives and were set apart for life. 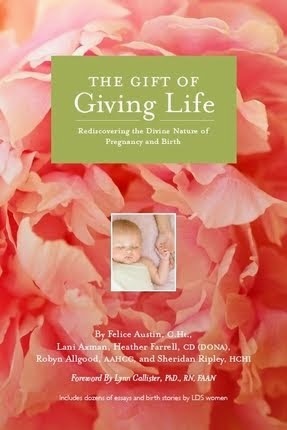 There is going to be an expanded version in "The Gift of Giving Life" book but this post gives the basics and it is really interesting information if you've never heard it before. Anyway, I was excited to discover that my post has inspired a new website called "Birthing in Zion". The organizer of the website said that after reading my post she was inspired to create a directory of LDS birth providers (OBs, midwives, doulas, child birth educators, etc...) all over the world. Her hope is that eventually there will be a listing for every stake in the church and that women will be able to find care providers that share their beliefs and see birth as an innately spiritual experience. I am really excited about this and can't wait to see where it goes. In about a week they already have 269 "likes" on their Facebook page and the directory should be posted on their new website soon. If you are LDS and provide birth services make sure you send in your information to them. 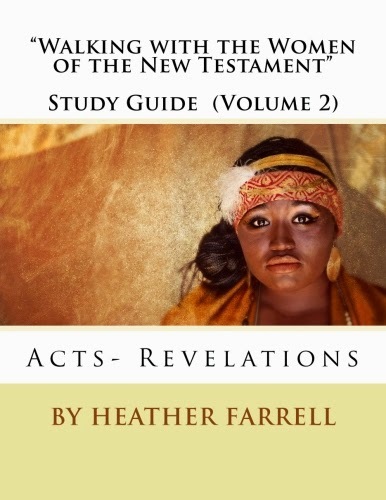 This is going to be a great resource! Question. When do you find time to say your morning prayers? I am really struggling with finding time to pray and am just wondering what works for everyone else. Saying them right when I wake up doesn't work for me because I am usually awakened way too early by little ragamuffins and my mornings are always so busy. I'd LOVE to hear any suggestions. This year is the 400th anniversary of the King James Version of the Bible. In honor of this anniversary BYUtv is going to be broadcasting a 3-part series called "Fires of Faith: The Coming Forth of the King James Bible" which documents the lives of the men and women who sacrificed to preserve the Bible. The first episode airs on October 16th at 6 PM. I am really excited to watch this. We don't have BYUtv but I am hoping that we will be able to watch it online. If not I'll just have to have someone record it for me. Also, I was really impressed by this post which gives ideas about to teach your children the basics of the Reformation. Forget teaching the kids... I need to learn this myself! It is sad to me that this part of history was left out of my High School education! I don't really know much about this at all and am excited to learn more. That is it! I hope you all have a wonderful weekend! I'm really excited about the BYUtv series as well, and grateful that I have my friends in the blogging community to let me know about it! Oh, morning prayer is so tough with little ones, isn't it? It's something I struggle with too. My kids are early birds, and I try to get up before they do to have a few minutes of quiet for prayer and scripture study. Some days I'm really good at it, but then my little twins will have a bad night, and I'm simply fighting to get as much sleep as possible. I try and keep a prayer in my heart on those crazy chaotic days until I can break away. My children are just like yours are this Halloween season. It's the first time they've been aware and excited for it, requested a certain costume, and ask 5 times a day if it's Halloween yet. It fun to see their enthusiasm. Morning prayers are a tough one. Sometimes I'll get a quiet moment before my husband leaves for work. Sometime I use my showering time to ponder and even pray a little. Sometimes I'll be able to get the little ones settled with VeggieTales after my oldest leaves for school, and I can take a step aside for a prayer or for some "me" time then. Sometimes the best I can get is pretending to still be asleep when my children come in for morning snuggles. I'll let them snuggle up and I'll silenty pray while they are calm and quiet (I've gotta be careful with that, though, because sometimes I'll fall back to sleep). 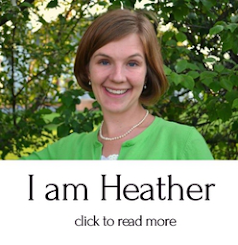 My friend just sent me a link to your blog...I am really enjoying it. We have 9 children, 8 boys. 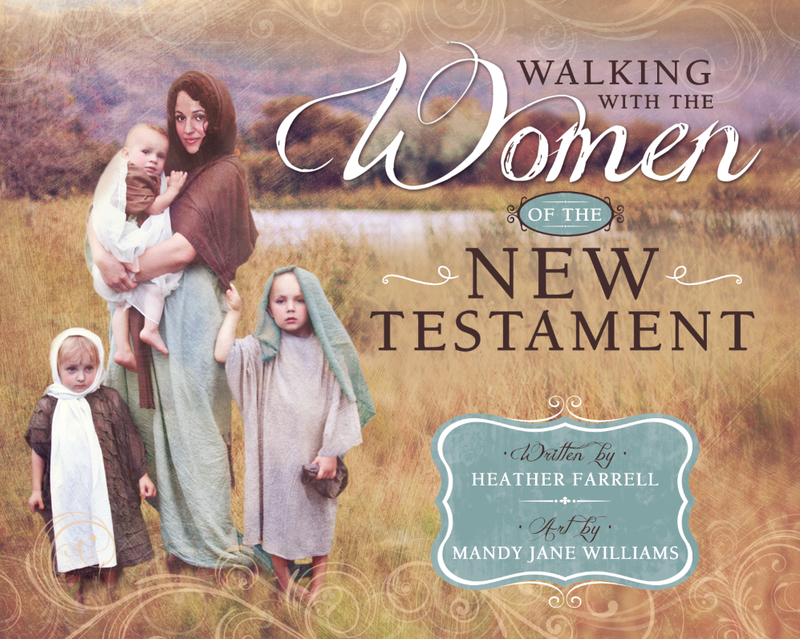 Women at the Well is an amazing presentation of women in the scriptures. And for morning prayers, I have to have them as soon as I wake up--like roll out of the bed and onto the floor--even before the bathroom or they won't happen. Now that we have a new baby, I am remembering why it was so hard earlier in my mothering. However, I was thinking maybe if you invited the little ones to join you when they come in and wake you up, they might learn of its importance as well. Thanks!! PS....I would like to make another comment or two, but to you privately. Is there a way I may contact you? 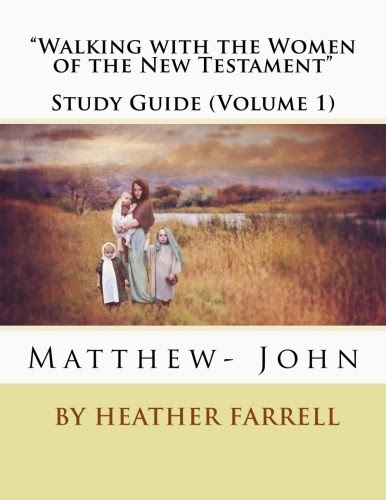 I would love to get the script to "Women Who Knew Jesus" but the link you had didn't work. Do you know how I can get it? Hey there! New reader and loving your blog. I have 5 kids, the youngest are 3 and 2. For awhile I was saying my morning prayers IN THE SHOWER...it was the only time I didn't actually have kids with me -touching me. Now I do it after my gospel study. If that gets interupted then I do it after my shower. I go in my room to get dressed and lock my door. I figure it's one of the best things I can do for my family. One thing that works is I sit with my kids for breakfast. Right after we are done we will kneel next to our chairs to have family prayer, and than take time for our personal prayers. If I can't finish my prayer all at that time, later in the morning when I do my scripture study I continue my prayers. The second is right after a shower, I will come straight from my shower to pray. I have also loved doing something Sister Beck mentioned and that was to take a notepad with me during my prayers so I can write down impressions, also I will write down things I need to pray more about. Oh I had 2 comments and I can only remember 1! Oh well. Anyway, Thursday night I got to go to a lecture hosted by the Church History Dept in SL on Patty Sessions. It was great. She delivered nearly 3000 babies and lost very few. You probably would have enjoyed it! I just emailed her and she sent me the program. It is fantastic. Thanks for linking to Birthing in Zion. Its been an amazing response. If you know of an LDS midwife, especially, but any LDS birth professional, please tell them about it and ask them to submit their information.